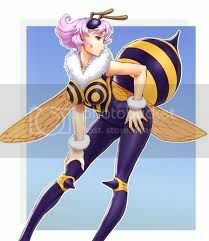 Bee girl, chest is a hardened yellow and gold shellplate, legs and feet have black shell pieces. Mandible Mouth, and antennae on top of her head. Phantasma grew up with only her father who simply wanted only one child. She always did everythign possible to try and make her father proud of everything she did, but even though she wanted to stay with him, she also wanted to see the outside world. Sindrax, her father, did not like the outside world or anyone in it other than the community of myrmidon they lived with and his daughter of course, but when Phantasma told him one day that she wanted to see the world, he was saddened. After many goodbyes to everyone she bonded with, she set out for Tandora for a new life.